A game that has redeemed its franchise and with tons of content to play with. Dragon Age: Inquisition is easily one of the most anticipated games of this year. Having Bioware’s favoured fantasy RPG being previously setback an entire year (and then once again for another month, as announced in September), die-hard fans have been waiting eagerly for Inquisition’s release. The game has had a lot to live up to, especially after the so-called universal let down of its predecessor, Dragon Age 2. However, in the franchises’ latest instalment, you are not just a mere mortal (if you wish) with a band of merry companions to manage. No, you play instead as the Inquisitor, a focal point to a much larger matter of reforming the world of Thedas that has been torn asunder by politics and civil war. If that wasn’t enough to keep you busy, demons spew from rifts due to a tear in the veil known as The Breach, causing those beings who were locked in the dreamlike Fade to wreak a nightmarish havoc among the world. 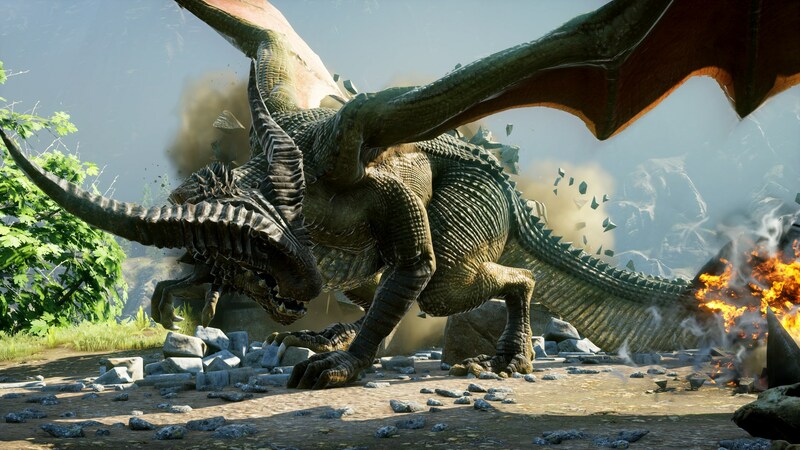 Even before the games release under a month ago, Dragon Age: Inquisition was met with more than a promising reception at conferences such as E3 and Eurogamer back in the summer. However, now that the game is finally here, does this latest chapter in the Dragon Age saga warrant the hype that has circled around it for so long? 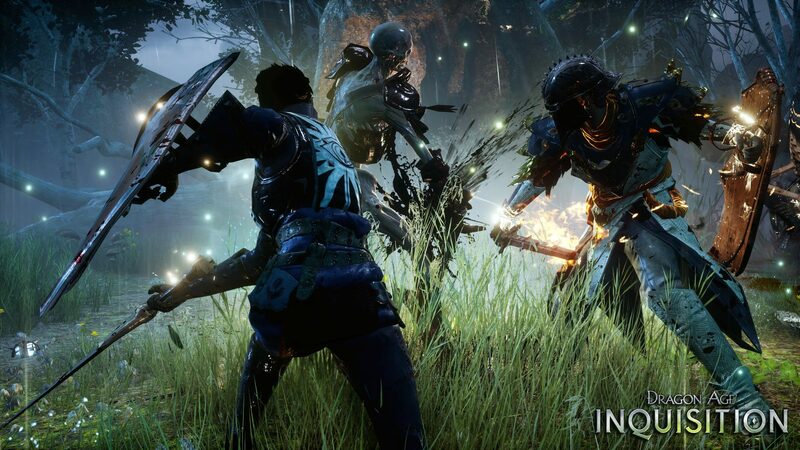 If one thing is for certain, it is that Bioware have been long looking for a Dragon Age instalment that is of the same spectacle as Mass Effect 2. Origins, while introducing us to this compelling fantasy world, always seemed to fall somewhat short due to the graphical and gameplay restrictions that are near unavoidable in a game made 5 years ago. This unfortunately meant that we never saw exactly what Dragon Age was really capable of, until now of course. Inquisition most certainly does not have the restrictions from previous instalments and it makes this perfectly clear in typical Bioware fashion, opening up with a more than memorable prologue. However, like with every fantasy RPG epic, one must first create a hero for its narrative to revolve around and Inquisition’s character creator tool is definitely something to marvel at in terms of detail. Choosing between Human, Elf, Dwarf and the now fan-favourite Qunari, players can customise intricate elements to their Inquisitor’s facial structure through a series of sliders and wheels, similar to The Sims 4. As seen in similar instalments, the creator tool even gives you the choice to pick which voice you wish your Inquisitor to have throughout your playthrough. There is a choice of either British or American accents, courtesy of Bioware voice actors such as Mass Effect 3’s Special Comms Samantha Traynor and Turian Nyreen Kandros (Alix Wilton Regan and Sumalee Montano) for your female Inquisitor and even Dragon Age: Origin’s Zevran Arainai (Jon Curry) if yours is to be a male Inquisitor. It’s a nice touch on Bioware’s part to add a range of voices to choose from, particularly in terms of the Dragon Age lore, as the Dwarf and Qunari races, for example, are often depicted with having American accents as opposed to British. With this much customisation one cannot help but feel a little intimidated, but it is advisable to take time to create whichever character you may wish to choose; and with a creator tool that is as robust as Inquisition’s, there really is no excuse not to. Once Inquisitors are made as attractive (or unattractive) as one may want, it is time to truly delve deep in to what Dragon Age Inquisition has to be offer. 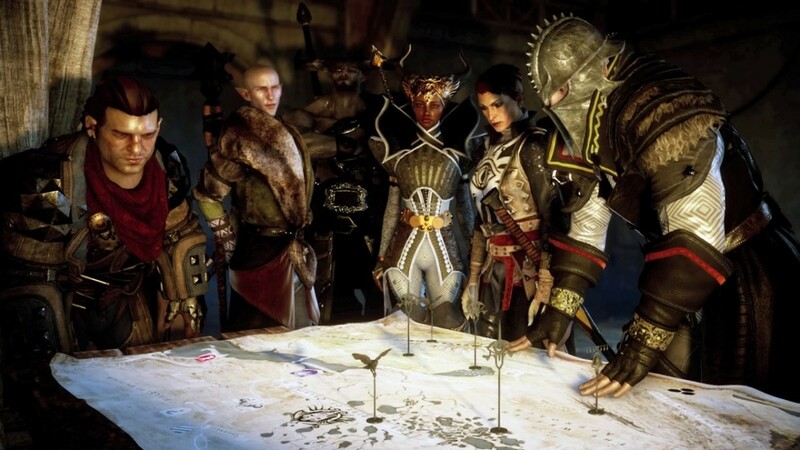 Depending on the world-state players may have chosen through The Dragon Age Keep, choices that were made in previous instalments are definitely present in Inquisition, something which can be brought to light when speaking to certain companions. It is advisable that one knows as much about the lore of Dragon Age as possible before playing Inquisition, not only in order to avoid any plot confusion, but especially as there are a fair few characters from novels such as The Masked Empire and Asunder (namely companions such as Cole and Vivienne, as well as Empress Celene) that have a presence in Inquisition’s narrative. It goes without saying that the Dragon Age franchise is one which does not lack for story; what is more pleasing is that references to the previous games, comics and novels gives an overall feeling of unity amongst every writer that has contributed. However, what is clearer here is that every entry in to this saga has been leading up towards Inquisition; this is particularly evident when looking at the long list of those who wish to see the Inquisition succeed. Characters such as Seeker Cassandra, the Champion of Kirkwall Hawke, everyone’s favoured storyteller Varric Tethras, as well as the return of Origin’s companions Leliana and Morrigan, all aiding towards the Inquisition’s defence against the mysterious Elder One and The Breach itself. These are characters that have played pivotal parts in Dragon Age thus far and are now assisted by a string of memorable characters that are superbly voiced and likable in their own way. The assembly of such a formidable group serves well to give the sense that whatever fate lies ahead will no doubt shake the entire world of Thedas. The fact that it is the player’s job as the Inquisitor to lead them there is another thing almost entirely. In the first two instalments of Dragon Age we have been a leader of a small band of individuals which have only towards the end made their mark. What is interesting here is that the role of the Inquisitor is sold to us as the first that holds any actual power. For the majority of the time this holds up within the narrative, particularly as the position calls upon the player to bring forth a conclusion towards the mage/templar war by choosing who will assist you against the final battle. This is further implicated when setting tasks for your advisors on the War Table, which is a more sophisticated version of the Galaxy Map of Mass Effect. It is also here that the Inquisition itself unlocks new maps to explore, gathers coin and influence based on the strengths of your advisors who vary from the armed forces of Commander Cullen, the spy-ring of Leliana and the political connections of Josephine. Despite this all being what reinforces Inquisition‘s impression that you are a part of something much bigger than Origins and Dragon Age 2 combined, one cannot help but feel extremely overwhelmed with a world that has now become so free-roaming. A prime example of this is in the early hours of the game where the first unlockable map is The Hinterlands, a map which has been teased by the developers as bigger than the entire map of Dragon Age: Origins altogether and containing an unbearable amount of side-missions. This stays true to Bioware’s idea of a modern RPG where in which the player has entirely full reign and for the most part the smaller quests are, in fact, beneficial. On the other hand, there are definitely times in Inquisition where one may wonder whether or not taking down a group of bandits or finding food for refugees will actually give the player anything in the long run other than, maybe, the false sensation that there’s their ‘good deed’ of the day, a facet of the game which felt more like an MMO in parts. After a while, and once you get a hang of the game, however, you’ll no doubt be able to decide what quests exactly count towards the success of the Inquisition, leading to eventual unlocks of the other regions of Thedas. Problems aside, I must say this is a definite must as each map is intricate and gorgeously individual, giving a true impression of Thedas that we have not seen in Dragon Age up until now. In spite of this, it is unavoidable that a game with the spectacle that Dragon Age carries would encounter a string of bugs that became quite an annoyance, the prime example of this being dialogue and interface elements that would suddenly stop during combat. Nonetheless, possibly the most humorous of these glitches was my own Inquisitor’s voice suddenly changed from being British to American in the space of a cut-scene. Although this was amusing, it personified just exactly how much technicalities such as this can take the player right out of what, in theory, is a truly atmospheric RPG. A patch has since been released that is said to have dealt with these issues, but only time will tell if this fixes issues players have noticed. Ultimately, it is no primitive idea at all that Bioware has concocted with their latest chapter to Dragon Age. Most of the time, Inquisition succeeds in its attempt to perfect the modern RPG with its attention to detail in the overall style and feel of the game, something which feels truly epic. This is definitely something in which fans can agree that they are receiving their money’s worth but may be more for a die-hard fan than someone who is looking for something a little more casual due to its seemingly endless amount of content. The combat is a massive improvement, feeling far more controlled in a hugely uncompressed world, which, even well past the 50th hour, can leave a player feeling as though they are only touching the surface of what’s available. It might be perceived that Dragon Age: Inquisition could have gone to the next level if only it had a more thoughtful plot, but the game is still a thoroughly enjoyable one that will no doubt bring fans back to it even after their first playthrough.